I only know this because I was asked once (one single time!) if I know anything about that. this is a Screenshot from PrismaTS (obviously in german) which shows the setting - I would translate it to sth. like "APAP control" or maybe "response"
If I would have to guess my money would be on making the response a bit "faster" - leaning towards how the AutoSet-Algorithm of ResMed works .... but once again: I have never seen this "in action" or read anything about it at all. ... could be very well that it does the opposite and leans more towards the "For Her" Algorithm. I'm using this APAP mode for the last 3 nights. I can not tell the difference, since I changed my high pressure setting from 14 to 16 cmH2O, and the softPAP from 3 to 2. I hope - as usual - only time will tell, if this setup fits better my treatment, but... this is not the point of this thread. The point is that I could find absolutelly no information on these settings over the Internet. I called Weinmann Biomedical Engineer, who is taking care of my needs - as a Weinmann client / end-user, asking him about these settings. 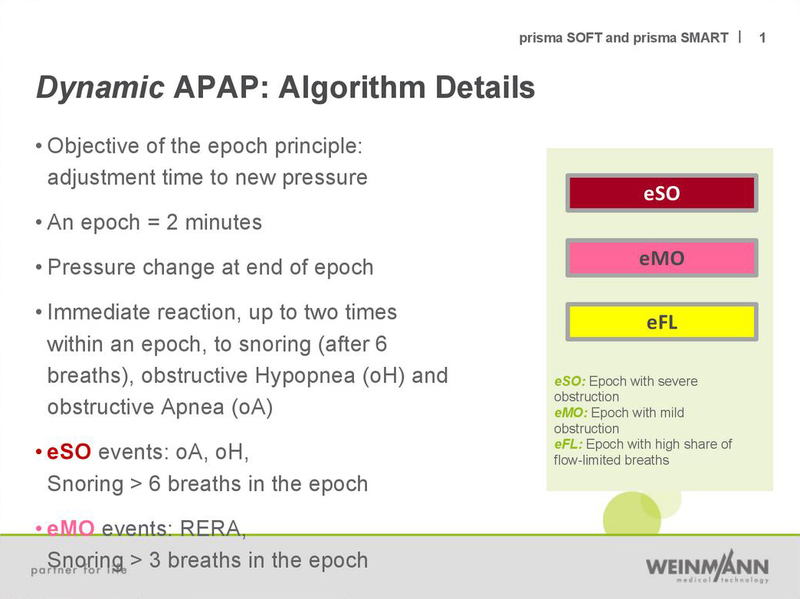 His initial reply was that most probably, according to his professional experience, dynamic setting should be a "faster - more agressive algorithm, trying to deal faster than standard algorithm with apneas during the patient's sleep with the CPAP / APAP machine". I thought this would take some time, although I doughted Weinmann would reply - and even if they would... this could take "some" time. Well... I was wrong!... 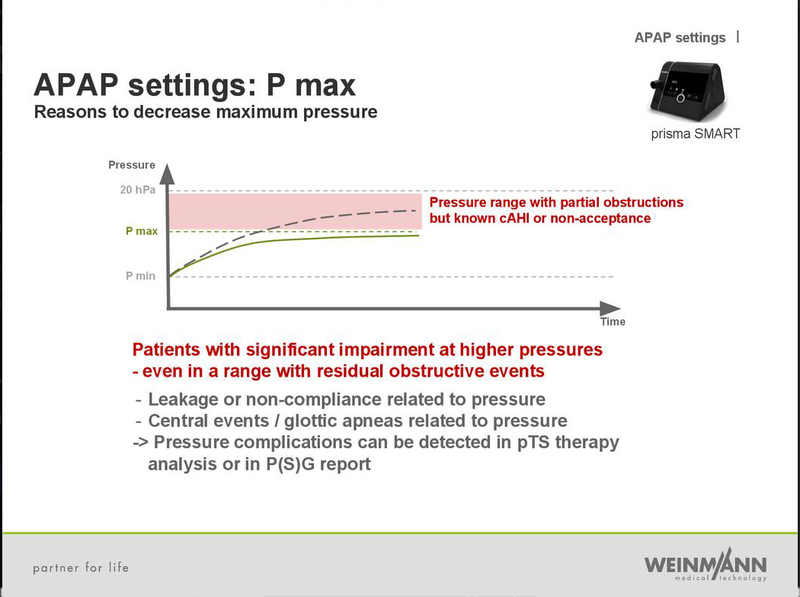 This evening I found an e-mail from Weinmann Biomedical Engineer, with an attached Powerpoint file from Weinmann, presenting - among other things the: prisma 20A APAP settings: standard vs. dynamic. 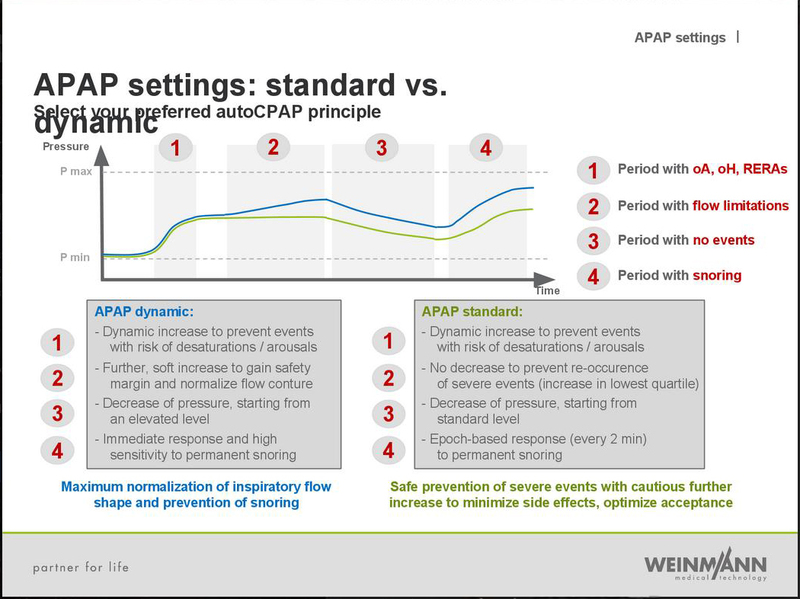 Here there's a general explanation of how to chose the right APAP setting... according to each patient's needs. ... which are the reasons for decreasing maximum pressure, based of prismaTS therapy analysis and reports from PG monitoring. All this information, with simple, easy-to-follow graphs. These explanations are necessary in order to understand the "mechaninsms" of the APAP function. Based on the previous explanations, follows a page showing in a comprehensive table, the standard and dynamic settings, and on which "case" each setting is recommended for. Here, things become more clear, as the following pages desrcibe how each setting's algorithm is working, this time with numbers. this is taken care of the FOT function. What is this?... 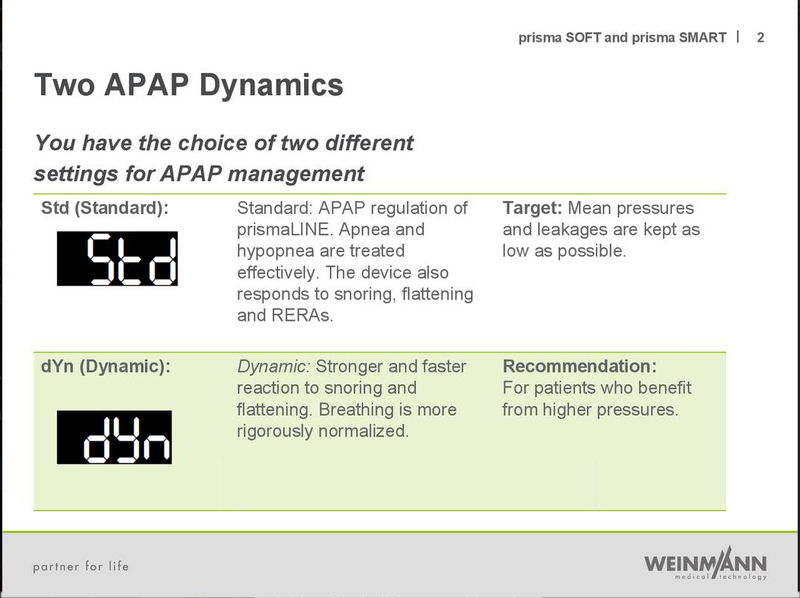 It's the "prediction of events" tool the CPAP is using, in order to "trigger" the APAP algorithms (std or dyn) to "take action". 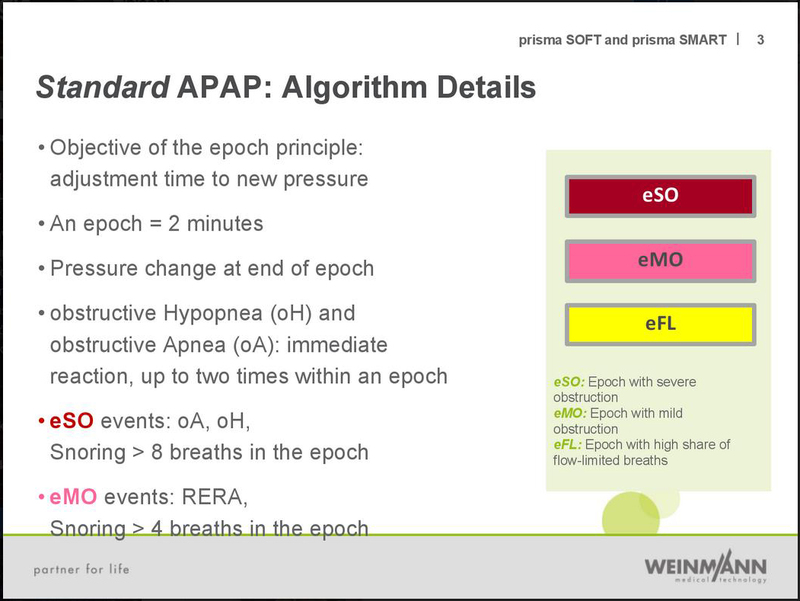 ... showing with numbers, how the APAP is really "dealing" with each "epoch" which is devided into 4 Quartiles, and the increase of pressure needed for series of events (eSO, eMO, eFL) in order to normalize the breath of the patient. I found this presentation really explanatory and at the same time easy to understand. 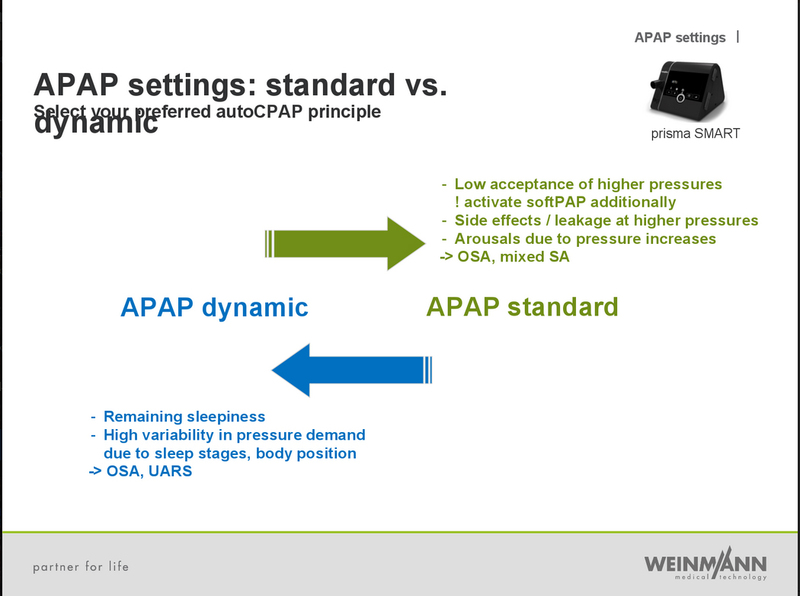 It really helped me understand the value of each setting, and according to my Weinmann Biomedical Engineer's experience, it seems that dynamic APAP setting should serve better my apnea treatment. 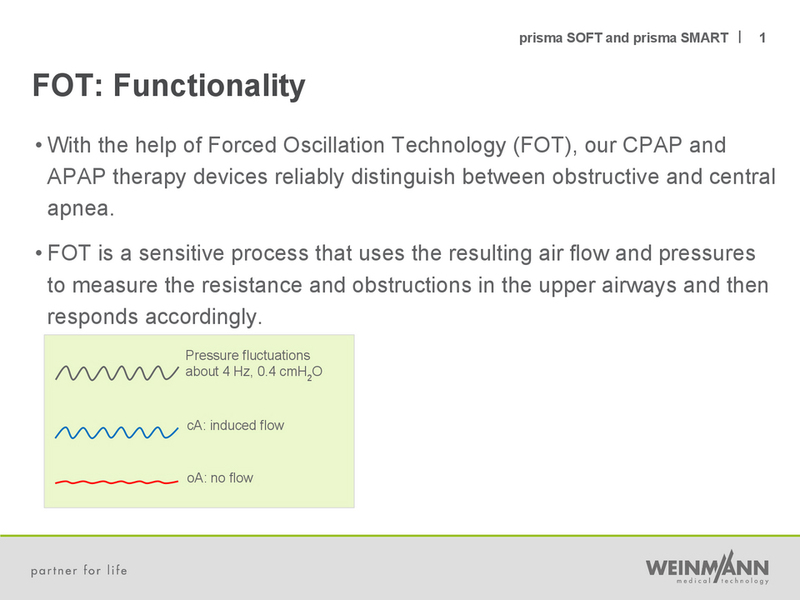 Weinmann is using a full time pressure turbine, meaning that the turbine is working continuously at full speed, producing full pressure, while the amount of pressure released to the patient is regulated by software driven valves, giving the CPAP a faster response time, over other CPAP manufacturers that are addressing this issue by increasing / decreasing the speed of their turbine, in order to catch up with the necessary pressures, usually issued in "beats" of air flow, instead of continious flow variations which prisma 20A is doing. This is clearly shown in the graphs in the study I've already posted in this forum, conducted by a Spanish University. 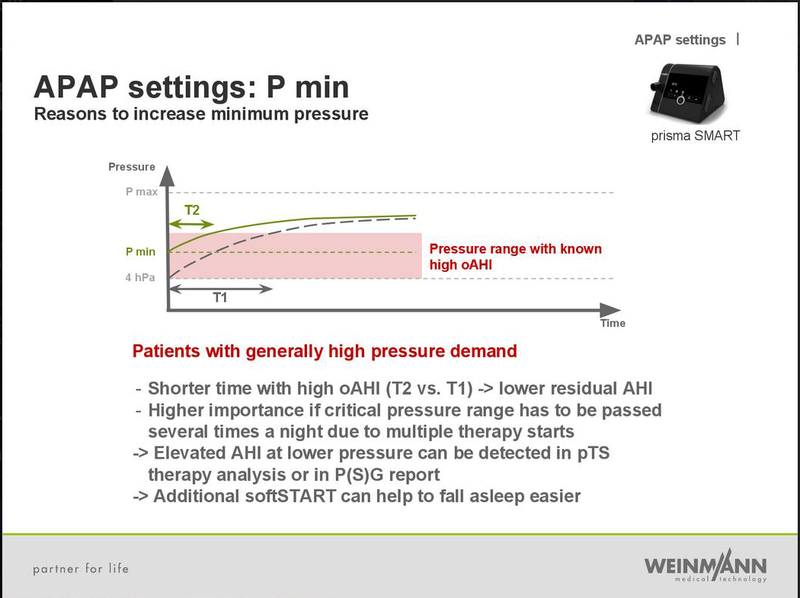 The graph above is showig this function of prisma 20A Auto CPAP. As a user I can tell that this continious "full throttle" turbine operation of prisma 20A is giving as result a very quiet operation, since it's impossible to hear the turbine going up and down while attempting to produce the necessary anount of pressure each time. Also, there's no feeling of sudden increase or decrease of air pressure, since this is done very smoothly and, of course, without any noise from the turbine. This is one thing I didn't like on Respironics System One - 60 series C-Flex Auto CPAP that I tried, before I buy this CPAP that I'm using now: Weinmann / Löwenstein Prisma 20A Auto CPAP. I think in terms of comfort (ease of breathing and noise) prisma 20A is well ahead of System One. Also, due to this continious flow of air, the prisma 20A doesn't ever give the impression that your breath is "following" the machine (trying to catch-up it's pump), but rather that you're breathing "with" the machine, without making any effort at all. I hope this thread will help us all understand how APAP mode is working, since basically I think all the CPAPs offering APAP function are using, with different approaches. 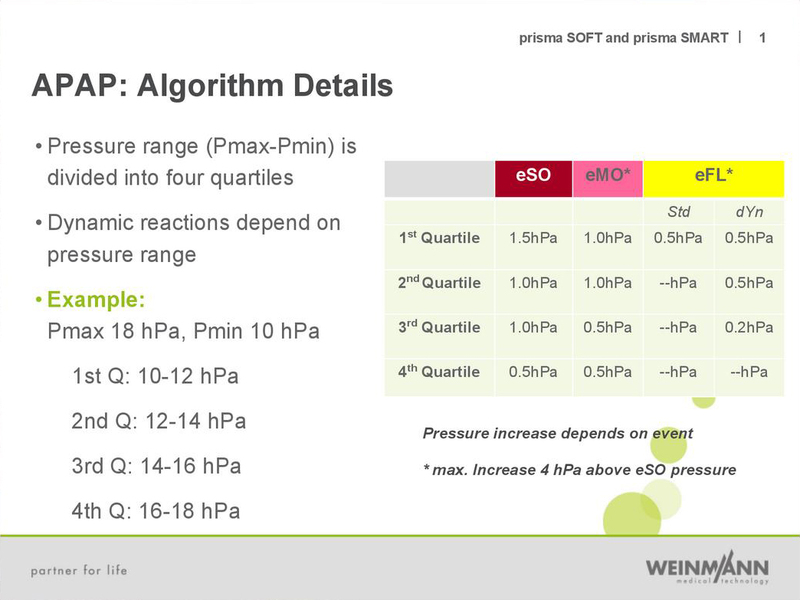 Different algorithms used and different ways of air pressure production and manipulation. Thanks for discovering this goldmine, not found elsewhere.